Bangladesh ARMY Job Circular 2018 been published today 02nd December 2017 at the official website of Joinbangladesharmy.army.mil.bd/. The application starts for the new ARMY job starts on Dec 2017 and the application will be available up to 20th Jan 2018. 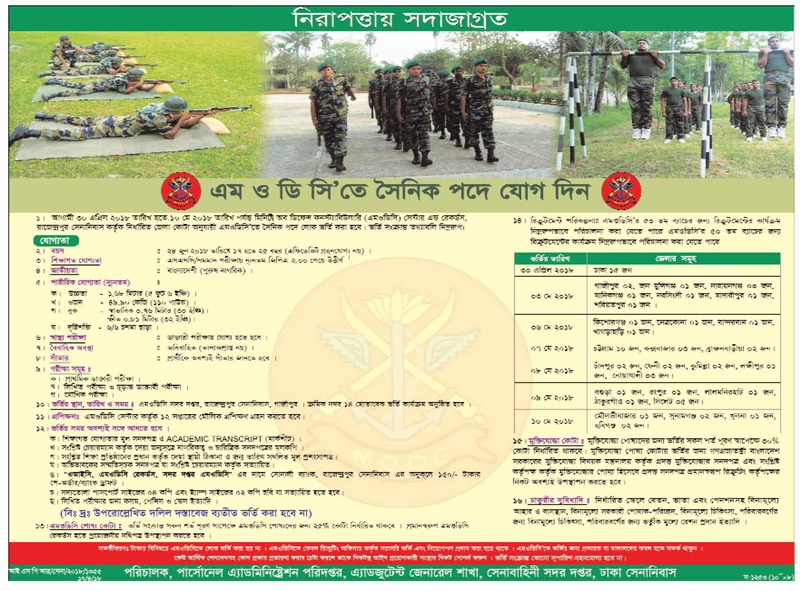 Bangladesh ARMY Job Circular 2018 has announced for the medical officer posts and the applicants need to be experienced about three years. There is a major category and many medical officer category available. To see the full circular have a look the official from here we have given below. Applicants need to fill up the online application form with all the requirements and they need to send the application at the office directly within the deadline 17th Feb 2018. Otherwise it will be not applicable. After successfully applying the task they need to attend in the examination. And they have to select by the exam result. The conditions and details will be available the circular file. To get such a gov job news stay connected with our website at www.bdresultpage.com. To apply from here you need to visit the Apply Online website from the link and fill up the form correctly with all requiring information.